Are you guilty of flying with your keyboard? Do you have a joystick that has the rudder built in (by twisting)? Have you held off on getting rudder pedals because it just doesn’t seem necessary? If you ask virtual or real pilots who have all three, yoke- throttle- pedals, they’ll tell you that you simply can’t live without. When you have all three, it completes your realism. It’s the Tried and True Trifecta. To fly without all three is unrealistic. Now, I know that the majority of you reading this are going to have all of these controls. Most of our pilots here at AOA take their simulations very seriously, otherwise they wouldn’t be training to learn how to fly them properly. That said, at AOA we also have a lot of simmers just starting out. Aviator90 sees a lot of newcomers into Flight Simulation. If you are a newcomer, or you don’t have all of these controls, read on and I will lay out some compelling reasons why you need all three controls. Here we go. Why You Should Have a Yoke, Throttle and Rudder Pedals. Unless you are flying an Airbus or a helicopter, you need to have yoke. A yoke is the golden standard in aviation. This is the control that you’re going to spend the most time using. Plus, here at Angle of Attack we aren’t huge fans of just engaging the autopilot or using AUTOLAND all the time. We think you should have a good feel on the controls, and a lot of practice hand-flying. You can’t do that without proper time spent actually using those controls. Out of all the controls, a yoke should be the first control you purchase. At one time, I had a CH Products Yoke. Although the yoke stood the test of time, eventually it just felt really cheap and unrealistic to me. The CH Products Yoke does have it’s advantages, the biggest being the lowest cost, getting you a yoke on a budget. However, compared to other yokes available, the CH Products Yoke comes in just a hair below others on quality. This yoke comes highly recommended from Angle of Attack. It’s well built, controls well, and it even comes with a separate throttle. Using these controls has proved to be well worth the money and investment. The buttons have a fantastic and intuitive layout, the yoke is built from great materials, and the digital display screen can serve many functions. If you’re looking for something super solid that won’t break the bank, and something that feels realistic, these controls are for you. These are the controls we’ve used for the majority of the training you see at Angle of Attack. If you’re not ok with plastic on your controls, and you simply want controls that are modeled exactly like the real thing, then look no further than GoFlight. These guys make controls and panels for only the most serious virtual pilots. In fact, much of their stuff is sold to flight schools and other outfits that use simulators for training purposes. I had the chance to try out one of their controls recently, which is a 737 Yoke. Man, what an incredible piece of hardware! This stuff is all metal, has a totally realistic feel, and handles like a dream. If I was rollin’ in the Benjamin’s, I’d totally get one. But for those simmers with deeper pockets, this is a no-brainer. There’s nothing like having a throttle for each engine on your 747 (4 engines) in addition to a speedbrakes and a flaps lever. Pushing the throttles forward, selecting TO/GA, and managing all of the pedestal functions right there on the throttle. It’s a dream you can achieve, though. With several throttles out there on the market, you can get another great step in realism by being able to control your power, secondary flight controls, and more. The CH Products Throttle, like the Yoke (and later the rudder pedals) only come in as the “Good” for several key reasons. First, is price. This throttle is stand-alone and quite expensive! In fact, you may pay more for the throttle than you will have the yoke and pedals combined. That said, the yoke does have 6 axis right out the gate, which sets it apart from the Saitek Throttle. If you’re a 747 driver, that might appeal to you. Like the other CH Products, this throttle is made mostly of plastic and just doesn’t have the feel of industrial quality. But it is the first throttle I had ever had, so it has a special place in my heart. First off, the Saitek Throttle actually comes WITH the Saitek Yoke by default. That alone is a huge benefit! The two are priced very low, when compared to adding together some CH Products controls. This throttle is well built, and can sit high or low on your desk with an adjustable bracket on the back. However, this throttle only has 3 axis. This makes it work for traditional single engine aircraft with a power, pitch and mixture. If you are flying virtual jets, you’re going to want to pick up another throttle, which can then be connected together, and operate that way. Come to expect nothing more than quality and fine manufacturing when mentioning GoFlight. This throttle, when coupled with the yoke, gives you an incredible flight experience, especially if you’re flying the 737 (which is quite popular). Made of metal and a robust internal system of pulleys and mechanical functions, this feels like the real deal. Also built in are several buttons for TO/GA which just cannot be matched by the CH Products or Saitek systems. Perhaps the control that everyone forgets about, and the control they get last, are the rudder pedals. I must say that the rudder pedals added a surprising amount of realism to my simulator, however. The day I got rudder pedals I was completely taken aback by how much more realistic it was to have to taxi with my feet, rather than just turning the yoke (actual aircraft are steered with the nosewheel, rudder, and sometimes main gear via the rudder pedals). My guess is that most of you have a yoke and throttle, and you feel you’re more or less set. I would also guess that there are many people out there that just haven’t bothered with rudder pedals. My friend, you are missing out. Rudder pedals will add a surprising amount of realism to your simulation! Especially when you start doing engine out procedures, and flying aircraft without yaw damper, you’ll find these rudder pedals to be incredibly immersive. These were the first set of rudder pedals I had. Although they did the job and I experienced a whole new level of realism, they just aren’t built well, are far too light, and don’t feel ‘realistic’ with their resistance. There is essentially no resistance when pushing the pedals. However, if you’re running on a budget and you feel like you’d be okay with these pedals, than it’s better to have them than to not have them. Over the past several years I’ve been using Saitek Pedals for all the AOA Training videos, and feel like they are the best bang-for-the-buck. They are well built, have an adjustable resistance knob, and have seemed to hold up well to the test of time. I’m well pleased. They work, they feel a lot like the real thing, and they compliment the other Saitek products well. Not a whole lot to say here other than: these are awesome. If you’re serious about realism, which I’m guessing you are, you need all three controls. If you don’t have all three controls, I would suggest you make plans to get all three. Forego buying any more addons before you take this step, as it is extremely important. You’ll notice that there are several price levels. Although CH Products are cheaper, I’d also suggest waiting a little longer to get the higher quality controls from Saitek. Should you hold out and save for GoFlight? Probably not, unless you can really afford it. Right now, just focus on getting setup with something that’ll work great. Later you can get some super nice controls if you have the coin. What flight controls do you have? Share your experience of getting your new controls. Please note: We reserve the right to delete comments that are snarky, offensive, or off-topic. If in doubt, read the Comments Policy. a bit PR article:))) Saitek is the worst quality, cheap sensors cheap build, all my saitek stuff after a year has some problems. agreed! My first ones I had was saitek and guess what I did, sold them after month to buy the ch products. best ones if you do not have money to invest in a expensives ones!!! today I have a pfc console and built myself a 737 control column and throttle. sorry for the person who did this comparation between saitek and chproducts, you are WRONG! To each their own. I had a terrible time with CH Products, you had a terrible time with Saitek. I would argue that the fact that most people are buying Saitek these days, and CH Products are harder to find, speaks volumes about who is making more money. I have a PFC Beech Yoke with hall sensors for sale (for cheap!) if anyone is interested. Sensors are an issue, I’ll give you that. But they aren’t the worst quality. CH certainly wouldn’t be heaps better, even in the best case. yup have them as mentioned Saitek Pro Flight Rudder 🙂 This is practical indeed and much better than previously rotating the stick. Though I had found the X45 rudder under the throttle much better than turning the stick. But neither can compare to the actual pair of pedals. Am I thinking wrong, would it be better to get pedals straight away and just use longer time training, or get flying in my fingers first? In my opinion, you need decent rudder controls. On a joystick, you have the twist grip, which although not realistic, isn’t bad. On a yoke, you don’t have this option. So, I’d say go for the rudder pedals! I actually got my rudder pedals BEFORE I got the yoke and quadrant (but after several joysticks), and I can’t miss them anymore. I still switch between joystick and yoke very often, depending on what aircraft I fly, but I always use my rudder pedals. Totally agreed here. Rudder pedals are SUPER essential. Saitek Pro Flight Pedals have just been ordered! Definitely do both. You’ll have to unlearn a lot of bad habits. When it comes to hardware i always look for realism, feel and handling. therefore, i go with GoFlight products. Yes, but you’re talking about HUGE costs there. I would recommend them as well. But the average simmer just doesn’t have that kind of budget. GoFlight is awesome. I’m really loving what they’re doing these days. It just doesn’t make sense for a lot of people because of price. But if you take your simulations REALLY seriously, it’s worth saving up for. Using an ACE yoke, Jetmax 737 throttle, and hopefully will be investing in a authentic looking rudder and opencockpit CDU/FMS soon. I might add, using an MCP also adds to the realism — I suggest CP Flight — completely plug and play. All those are great… You’re a lucky guy! That’s some super, super nice hardware, my friend. I’d ave to disagree with both Zoltan and Alexsandro here. I’ve been running FlightSim and using both CH and Saitek Products for more years than I’d like to admit. In the old days, CH was your only choice so I used them. The problem I had was that the programmable keys on the throttle/joystick would quit working over time so you would end up having to buy a new one. And it seemed like the CH products tended to last shorter and shorter amounts of time before you had to replace them. So, I switched to Saitek. Right now I’m using the X65 system. Immediately I noticed an upgrade in quality and precision. I particularly like that that joystick doesn’t move, but works off of pressure sensors in the base (just like a real F-16 and many commercial aircraft). But, alas, after about a year’s worth of use, my switches on my Saitek throttle started to fail so I had to replace the whole system. You can’t buy the throttle or joystick separately. My assessment would be that Chris is right on the mark here. CH products are less expensive than Saitek but not as well built. With CH you can buy you throttle and joystick separately as you can if you use Saitek’s X52 and a separate throttle. But I’m really sold on the X65 system. Very precise, very good control and like my trackball, I don’t have to move my arm all over the place to make my joystick work. In conclusion I’d have to agree with Chris. CH are good products but not as sturdy, well built, or as precise as Saitek. However, Saitek is more expensive. The ony other product abailable but not mentioned here is the Thrustmaster A10 Hotas set up. Very good joystick/throttle setup but also very expensive. Loving this assessment! We have to keep in mind that the average simmer just can’t afford super expensive controls. I see people not even getting rudder pedals because they are too expensive. So if that’s the case, why would someone be able to afford something like Engravity or FDS? It’s just not likely at all. I’ve seen and played with the HOTUS a bit. Wow, incredible piece of hardware! But again, very expensive, and not that attractive to the average joe. I started with the CH Products Eclipse Yoke (with 3 buildin levers) and the pedals. After a few months I replaced the springs with double rubber bands to improve the handling of the yoke (less pressure = more precise control). 4 montgs ago I purchased the throttle Quadrant at DigiKey for only $100 + shipping (to Europe). But I also have a thrustmaster T-Flightstick X as a real joystick, which is a must if you like to fly fighter jets or the Airbus X Extended where the sidestick is used to position the ‘flight director’ instead of making the roll or pitch yourself. Using FSUIPC I assign whether the yoke or joystick is used for an ‘aircraft’. I only sometimes forget to alter the ini file to generalize the profile name to make it fit similar aircraft.. When I got my first PPL lessons I noticed that on final for a runway to have to make rather large adjustments on the yoke to even change the alignment, while if I make the same adjustment in FSX I already fly upside-down.. It is one of the areas Lockheet Martin (P3D) is currently working on, next to a million other issues..
FSUIPC is always incredibly helpful regardless of what controls we are using, eh? Thanks for your input. A bit of a sidestep here, but a quick question. Could you point me to a proper guide for setting up the FSUIPC? Have had a look into the FSUIPC, but just looks very advanced/difficult. I’m not sure of other guides out there, but we have a very in depth guide in our 737NGX training that goes through ALL the control setup. That’s quite in depth. But I’d hate to push you that direction just to get the FSUIPC video. Is there any difference in axis control/movement, or is FSUIPC just improving the button assignments? $600,00 GoFlight vs $ 680,00 Throttletek. And look at the differences! They LOOK different, yes. But I can’t speak with any authority on ThrottleTek until I have tried it. And others that have are always welcome to submit an article to us for publishing. The throttle is, as I speak, on his way. So, in some weeks, I will give you a review. Would love to hear your thoughts and feelings on the matter. Let me know! The difference, is ThrottleTek is made of plastic, and GoFlight is metal. So you are paying the same price for a difference in quality of materials. In the end, it’s up to you. All the best. This was so coincidental! I just ordered a complete set from Saitek. Got the Cessna yoke plus the Saitek throttle and the Saitek Cessna rudder pedals. Can’t wait to try it out! Delivery expected in about Thursday or Friday. Wednesday if I’m lucky! Right on! Let us know how it goes! I think you’ll be really happy! I didn’t want to list stuff that was meant for commercial use, like actual flight school simulators. These are the ‘best’ meant for the vast majority of simmers. There’s no arguing that a yoke like that is best. But the chances anyone reading this will buy one are slim. yeah, these guys do a great job. I have some of their handles to put on my Saitek Throttle! I’m finally going break down and buy a yoke/rudder set. It will likely be Saitek, due to the reviews and price. They seem to have a “pro” and “pro Cessna” version of their yoke and rudder. Is there a major difference between the two? Just keep in mind that the cessna trim wheel will not work with the 737NGX. That is the news I’m hearing. Other than that, the build and inner components are no doubt much the same. It’s really the ‘style’ that is different between the few models. I have a feeling the Cessna trim wheel will work with NGX but you have to use a Lua script in FSUIPC. Im sure i had it working on my old pc but lost the old Lua during the changeover. I haven’t got around to installing the NGX since i built my new pc so i haven’t tried it yet but so far the Lua i use now works with everything else i’ve loaded, default and payware. Chris. Which do you recommend for GA flying. 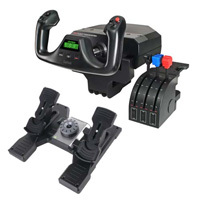 The Saitek generic or the Cessna configuration? I would still do the Saitek Generic. You’re paying a bit of a licensing fee with the Cessna stuff, and unless Cessna is what you fly most of the time, I feel the generic works better. It’s what I have, and I really enjoy it a lot. Well Chris I got the Cessna rudder pedals for cheaper than the generic one off from Amazon and I truly love them. I could not agree more! I simply could not handle flight simulator without all three. Writing reviews on flight simulation software would be nearly impossible without them! I run CH pedals for now, but have upgraded to Saitek for yoke/throttle quad. I also use the amazing Saitek X-65F for flying some of my military hardware, but even then, I still use my pedals. Well the set got delivered and well, too much deadzone meaning I have to turn it nearly 50 degrees to even start to turn the plane. You got it fixed though. Happy to hear! I’ve had my Saitek yoke and rudder pedals for about 4 years now and would never go back to a joystick (apart from helicopter flying). They have had a fair bit of ‘stick’ over the years and but have never given me any problems, so I can vouch for the build quality. I found that using the double sided Velcro a much better way to mount them to my desk rather than those huge plastic clamps, but I do have the benefit of not having to move them. I recently added a second throttle quad, and the totally brilliant Saitek trim wheel. Now THAT is s great piece of kit! Pressing a button or using the tiny wheel on the Saitek MFU just doesn’t cut it for me. I’ve finally managed to get everything working with the full version of FSUIPC too. The trim wheel was a challenge but setting up the rest of the kit with it was fairly straight forward. Its worth the time to get it done right as it makes the whole flying experience so much more realistic. Sooo many toys! Glad your experience has been great as well! Scrap my last post. I finished configuring it and Oh My God! I’m never going to a joystick again! I just need to practice landing on the center line and get used to the pedals. YAAAAAY! So happy that all this paid off for you! Hi Chris! I really love that you posted this info regarding the these peripherals that will make the whole virtual flying more realistic. I yet to purchase these. Do you have a listing of your system specs and the software you’re using? I was more interested in the terrain and weather generators. I also sing the praises of ORBX and FTX whenever I possibly can. Nothing matches what they do. Thanks for being so responsive as I cannot begin to imagine how much of a job it is to just respond to blogs and emails. It’s a lot 😉 but it’s important! What do all y’all think about getting the CH equipment used, from Amazon (or less desirably) EBay? There are some reasonable prices there. I have Saitek’s X52 HOTAS and a Cyborg v1 stick. About a year ago someone gave me a ThrustMaster HOTAS. However, because of medical bills it will be a long time (if ever) that I can afford the equipment in this post. Cost aside, I just don’t have the space for the the yoke and throttles. Just like Justin Fan, I, too, would have to wait for b-day, Christmas, and another b-day before getting the equipment 🙁 So it goes. Another thought just occurred to me. Is there any way to mount the yoke and throttles on a wheelchair? They’d have to mount/dismount quickly. From descriptions on Amazon, it sounds like just regularly mounting the yoke is a hassle (something about grooves on the underside). Does anyone know if you can use your headset with FSX? If so can you do real time communication with ATC/Ground Control or others? You need to fine the ip and then go on the local server list, and then press remote connect and type in the ip there. I’m glad to find this article. I have been shopping for new yoke since I’ve restarted this hobby and have stalled due negative reviews and high price of some models. I have an old CH Yoke and pedals which work perfectly after almost ten years of use, but lacks the realistic look and feel I’m looking for. I was especially pleased to see Saitek recommended because it appears they have fixed the random input issue their flight yoke was know for. I had “written” them off years ago after reading all the negative reviews. Thanks to this article, I will definitely consider Saitek a possibility. Thanks for posting. One more thing…where is the Google +1 button so that I may do my part in getting this article the attention in needs in my small but growing circle of aviation enthusiasts? I’m not much of a Facebook user. Thanks. Does a yoke do the fighter role? Does it auto-center? Credibility disappears whenever I see Saitek called “the best”. It’s cheap plastic junk. ‘Course, I’m only a 2,000 hour+ licensed private pilot/owner – what do I know? Out of some options, it is the best. Although the only thing I said it was best at were rudder pedals, seeing how there isn’t a lot of other options out there. I don’t think Saitek is the best. But it’s the best out of the cheaper stuff. I’ve had my Saitek yoke for years and for most of the time I’ve owned it, my opinion of it has been that it is wonderful and has served me well. That all changed however when I started taking lessons toward my PPL in May of this year. The yoke has a nasty reputation for the pitch axis being ‘sticky’ in spots when flying one-handed, which you normally do when you are climbing out or on approach. In other words, it’s impossible to smoothly make small corrections to pitch when flying one-handed. This makes it very difficult to accurately execute landings, especially in small GA aircraft. I’ve since modded my yoke (which is old enough that the warranty was already void) to remove all of the springs and replace them with rubber bands. It now has a much closer feel to the C172 I am training in, but the issue with the pitch axis is still there. Some posts have suggested cutting the nylon bushing at the front of the shaft, but I’m hesitant to do any more modding until after I get my PPL. I made the mistake of purchasing the Logitech G940 Flight system for around $650 work fantastic for the first year and a half now the brakes stay on all trim and rudder spike continuously. and sometime all three controls rudder, throttle, and or joystick are not recognized by FSX until a restart of FSX. Not sure if this is fsx fault or Logitechs, makes it impossible to land. this is very frustrating as I also use FSPassenger career mode and after a 4 hour flawless flight, well you know what I mean. But still I love flight sim I am addicted and have been for around 12 years now. Looks as though I will get them. Ill let you know how they are. Yes, let us know! Thanks for the report. And for what it’s worth, I’m pretty sure you can get that GoFlight stuff from a more local retailer. Hello, how many Saitek Throttle do we need to fly Jet and 737 aircrafts? Thanks!!! does real fighter plane use yoke or joystick? Hi. I’d recommend that you consider MFG crosswind rudder pedals (best) and drop the Saitek back to the second (better) place. Training Straight to Your Email. No Spam. Ever. Want Every Episode of AviatorCast? Get FREE Email Updates! Become a Stellar Aviator. Every Saturday at 0000z get a fresh, new episode of AviatorCast. We hate spam as much as you do. And we will NEVER share your email with anyone.